TCX-Easygate: How does it work? TCX-Easygate: how many numbers can open the gate? SMS Printer: Can it be used stand-alone or do I need a server? AWS-X Weather Station: can it send data to a WEB server? 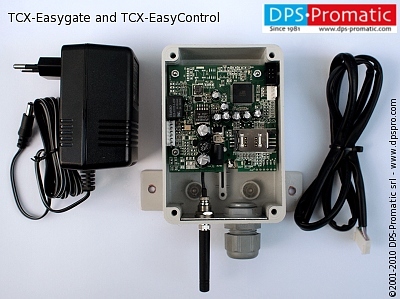 TCX-Easycontrol is the simple ideal solution for most of the problems that can be solved with a GSM remote control. You need to send an alarm from your home alarm system to your phone by SMS? You want to receive an SMS after a certain number of event have occurred? You want to be warned when at home there is no power? You want to switch on an irrigation plant? You want to control temperature with heating or cooling? You want to reset a remote computer server? For all of these problems and many others, TCX-Easycontrol is the just price reliable solution.